We are developing a computerized model of hominid teeth to examine the way in which the spatial and temporal localization of cell division and differentiation in the tooth germ is associated with developmental and phylogenetic variation. This model is derived from serial CT scans depicting the tooth germ, visualized at the dentin-enamel interface and by confocal microscope analyses of prism structure. These studies are designed to investigate the timing, duration and severity of specific developmental disorders incurred in utero and in infancy and their effect on growth and development as expressed in anomalies of the primary teeth. Development of the primary teeth begins in the 6-8th week in utero. The distinction between prenatal and postnatal development, using the neonatal line, provides a powerful diagnostic tool for distinguishing between developmental insults occurring in utero and those occurring in the neonatal period and early infancy. History of disease is an integral part of human history. For diagnosing diseases in human skeletal remains and their possible causes we are using traditional morphological methods along with the X-rays, CT-scans and ancient DNA analysis. Several hereditary diseases, primarily hemoglobinopathies, are highly prevalent in populations residing in regions that have been infested by malaria. Claims for the occurrence of thalassemia in prehistoric populations have been made on the basis of skeletal pathology. We have detected a known mutation in the ß-globin gene in the skeletal remains of a child with severe porotic hyperostosis. Our bones and teeth provide a permanent record of our life history. They are the key to interpreting all aspects of our past-our origins as well as the major events in our lifetime. For this reason skeletal and dental remains of past peoples are an essential component of research into human evolution, population diversity, disease and nutrition. In addition techniques developed in these studies provide the standards used in forensic identification, especially in mass disasters. 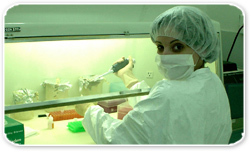 Research in our laboratory focuses on development and evolution of populations of Israel and the neighboring regions. The earliest fossil hominids from Israel are from the site of Ubeidiya and are over one million years old. Later fossils include the Galilee skull some 350,000 years old and those from Mount Carmel (Skhul and Tabun), Kebara, Qafzeh, Nazareth and Wadi Amud. The specimens found at Skhul and Qafzeh are over 90,000 years old. They include some of the most complete early examples known of Homo sapiens sapiens. Israel is the only country where Homo sapiens remains have been found that predated Neanderthals. Between 13,000 BP and 7,500 BP, human populations in the Near East shifted from an extractive mode of production, founded on hunting and gathering, to an economy based on primary production through domestication of plants and animals. In the Southern Levant the transition to agro-pastoralism took some 5,500 years and is associated with the Epipaleolithic (Natufian)-Neolithic Periods. Examination of skeletal remains from these periods shows that the associated changes in technology, diet, occupation and settlement patterns affected health and nutrition, especially of women and children. Chalcolithic – Recent Populations The Chalcolithic-Early Bronze Age populations were the direct descendents of the Neolithic populations. They were farmers and pastoralists, and show few characteristics to set them apart from living populations. They were followed by the Early Bronze Age people who built fortified towns throughout the country, introducing the difference between urban and rural lifestyles. Subsequent periods show repeated conflict often introducing new people and cultures such as Israelite, Philistine, Phoenician, Hellenistic, Roman, Byzantine, Arab, Crusader and Ottoman. DNA ancient and modern Genetic data on present-day populations are being increasingly applied to reconstruct the origins, migrations and relationships of past human communities. The analysis of ancient DNA (aDNA) preserved in well-dated archaeological remains provides an independent approach to such studies, giving direct evidence to support or reject a particular hypothesis. aDNA analysis is a novel research tool with many applications in fields ranging from history and anthropology through genetics and emerging diseases to forensic medicine. aDNA techniques provide a unique opportunity to retrieve genetic information about past populations unavailable by any other approach. In our research we combine traditional anthropological methodology with that of modern molecular genetics and corroborative evidence from other research disciplines.